Today has been laundry day. Ugh, I am the worst with laundry. I never learn to just do a load a day. I always just let it pile up. I don't mind washing and folding, but I HATE putting everything away. I don't know why...I just do. We also have the AC repaired upstairs so last night was our first night back up in our beds! Woohoo! It was so nice waking up and being able to work out to my DVR! It was a great start to my day even if I did have the laundry taunting me. So, since we are back up in running in the house, I have been cleaning and trying to get things in order. So, easy food day all day. May is National Salad Month! I know that thanks to HEAB. I will be honest with you...I celebrate the almighty salad multiple times a day every day. I would be lying if I said differently. Heck, the bean balls I had last night with sauce and spaghetti squash...I threw on a pile of raw spinach after I took the picture. I call it a healthy addiction. I just love the hot/cold/soft/crunchy all together! 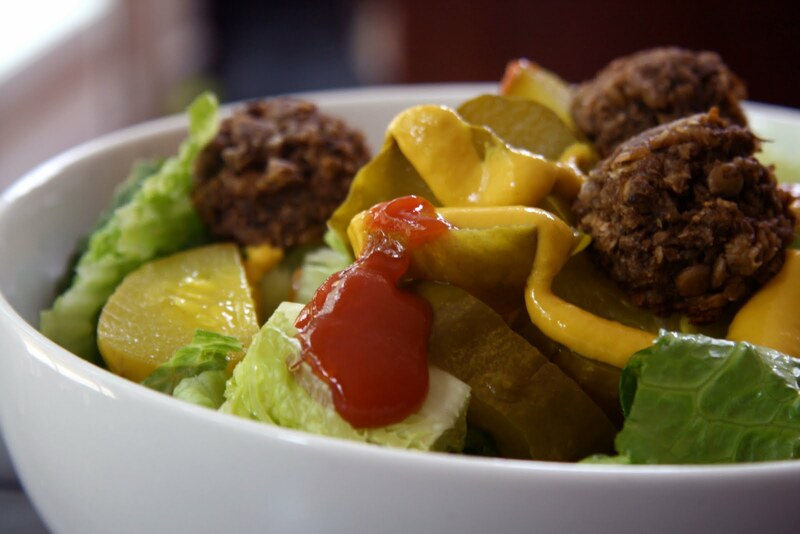 So, today was a burger salad with romaine, pickles, quinoa lentil balls, mustard and ketchup. This was so good. Another truth...I don't eat "burgers" as sandwiches. I normally have them on a salad. Sometimes I will make croutons to go on it, but I like loads of veggies with it. 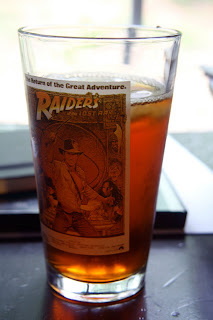 I had it with a big glass of iced chai tea! Very refreshing! I sweetened it just a little with a couple drops of vanilla NuNaturals Stevia. I love that stuff. I can control the sweetness and it gives a hint of vanilla to my tea! 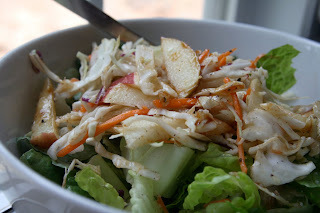 I got this idea the other day from Healthyexposures...apple bbq salad. OMG this was so good. Light, refreshing, slightly sweet...she knows how to put flavors together! This was romaine lettuce, cabbage slaw mix, celery, sliced fuji apples and bbq sauce. Perfect for warm weather! Dessert was not a salad...but it used up things we had left over, so it was perfect for easy theme of the day. 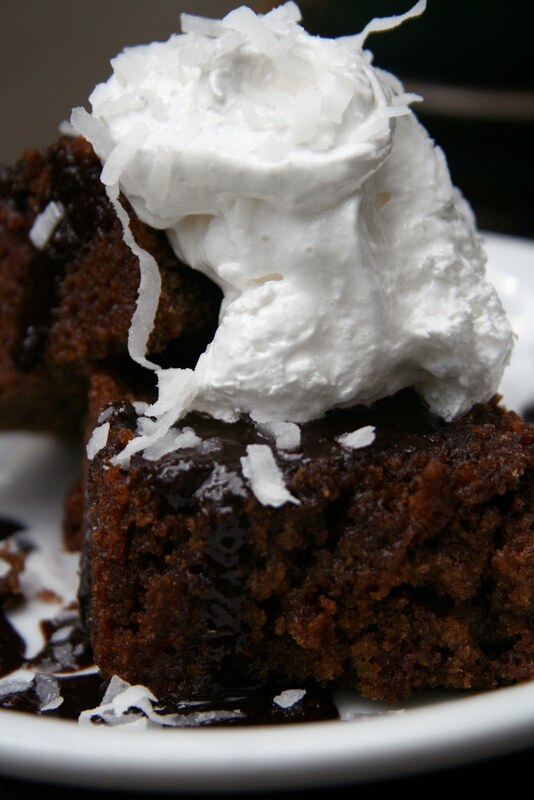 I made a gluten free chocolate cake with the left over chocolate sauce from the lamingtons, served with more left over chocolate sauce, topped with seven minute icing and coconut. Perfect balance for my meals today! So, do you eat salads? What is your favorite mix? Anything with chickpea and cheddar over spinach is a hit with me. have you tried hemp oil dressings? Tasty! Lol. I might have thought that tall glass was beer instead of iced tea. I love how you but burger-like balls on you salads! That makes them a lot more fun I feel like. I have no problem washing the laundry, it's the whole process of putting it away that stumps me! Salad...MMMMM. I pretty much eat at least 1 salad a day. I can't believe I've been so dense. I've been commenting on blogs all over the place about how great the salads they've been featuring are. and yet- your post is the first time I realized it's salad month. I have two staple salads. Field greens with tomatoes, shrooms, sprouts, and hummus. Raw kraut with kimchi, hemp seeds, and nooch. Lately, I've been subbing greens for nuts to get my protein, and eating a different green at every meal! It's great for digestion and definitely works at keeping me awake! Ahh your eats are making me so hungry LOL! Mmmm I am loving that salad!!! 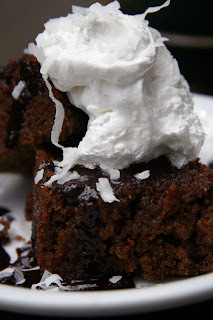 And that chocolate cake too! I like salads that are unsalad like. I like some greenery but not all lettuce and I warm salads are definitely a winner over cold one's for me. I can't believe I havent celebrated yet! I like my salad with tonsss of toppings.. and hummus! I love a good salad and these look seriously delicious. I am the worst at laundry also. I sometimes let it pile up for two weeks, when it really wouldn't be so bad if I just did it weekly. Sigh. I'll take one of everything you posted there. That dessert looks incredible! I also celebrate salad day/month every day, but I'll make an extra special one for the occasion. BTW you are NOT alone with being bad at laundry, I'm TERRIBLE! Salad. Anything raw. Nothing cooked and then I'm all good. Just a huge pile of raw vegggies and smeared together with tons!! of dressing. Your point today about Skylar being offered food and being too young to ever comprehend that someone would offer her something that wasnt good for her...oh that resonated so much with me. She actually started crying with the forced brownie as she didnt want it but trusted this lady as someone who would give her only good things. Children, so trusting and innocent.